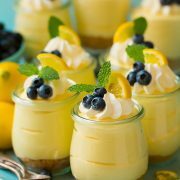 White Chocolate Mousse – it’s deliciously rich and fluffy and one dreamy dessert! 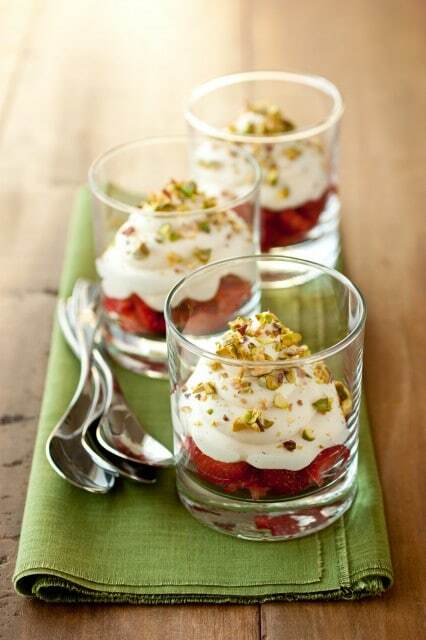 Here it’s layered with fresh strawberries and crunchy pistachios for contrast. An decedent elegant dessert that’s perfect for any celebration. Combine three of my favorite foods and what do you get? This White Chocolate Mousse with Fresh Strawberries. I absolutely love chocolate, cream and fresh strawberries so it’s only fitting that they come together to create a simple, sophisticated and incredibly delicious dessert. This mousse is fluffy, creamy, and delicate all at once. 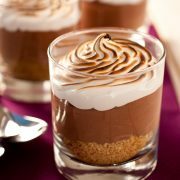 The key is in the whipping, which incorporates air into the mousse to give it it’s light and airy texture. Which Would You Choose, Pistachios or Pretzels? I had created this recipe with the pistachios and then I had some pretzels just sitting there and thought, mmm yes I have to try it with pretzels too. Something like strawberry pretzel jello salad, but to me so much better. I mean it’s basically replacing the jello with white chocolate and I’ll always choose chocolate over jello =). Either topping choice, whether pistachios or pretzels, this trio is the perfect combination. Fresh, juicy, naturally sweet and lightly tart strawberries are topped with a sweet and luscious white chocolate mousse, then it’s finished with just the right amount of tasty crunch. 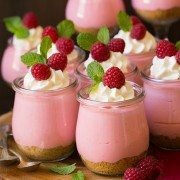 This dessert is unbelievably easy to prepare and is the perfect choice to impress guests without a lot of hassle. The only problem will be finding the desire to share them rather than keeping them all for yourself =). Enjoy! White Chocolate Mousse - it's deliciously rich and fluffy and one dreamy dessert! 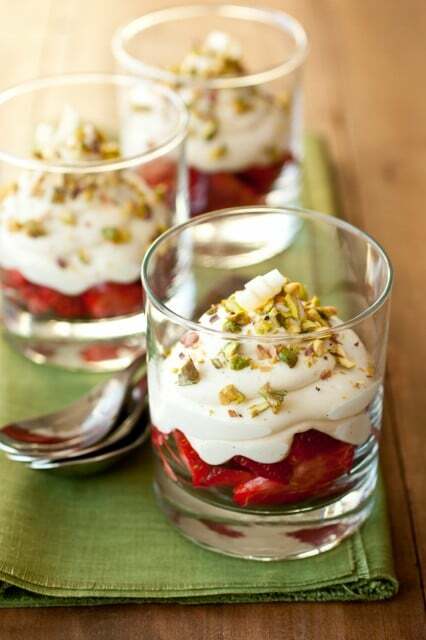 Here it's layered with fresh strawberries and crunchy pistachios for contrast. An decedent elegant dessert that's perfect for any celebration. Place chopped white chocolate in a heat proof mixing bowl. Heat 1/2 cup heavy cream along with vanilla bean seeds in a small saucepan over medium heat just until cream begins to gently bubble. Remove cream from heat and pour over chopped white chocolate (be sure to scrape the remaining vanilla bean seeds from saucepan into bowl as well), then whisk mixture until chocolate has fully melted. Cover bowl with plastic wrap and refrigerate 2 hours. After 2 hours, in a separate mixing bowl, whip remaining 1 cup heavy cream with an electric hand mixer set on high speed until soft peaks form, then add in corn syrup and whip until stiff peaks form. Remove white chocolate mixture from refrigerator and fold whipped cream into white chocolate mixture. For a fluffier and slightly more stable mousse if desired, whip mixture about 30 seconds on low speed. 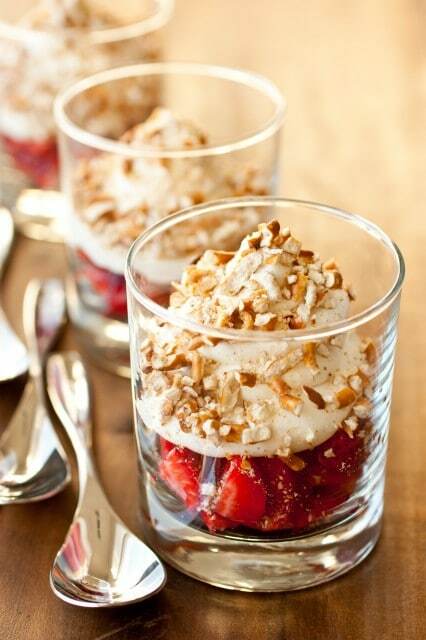 Divide strawberries among 6 cups, then pipe or spoon white chocolate mousse over strawberry layer. Sprinkle tops with pistachios or pretzels just before serving. For best results serve within 3 hours. *I used unsalted pistachios but I think salted would also be delicious.